Rather than just India, let us look at global trends. Increase in GDP leading to increase in disposable income- sadly I don’t find much of companies in listed space here. People spend money on iPhones, foreign trips, electronics, furniture, flats. I don’t find many companies in listed space that can benefit from this one. Patanjali is one company but is unlisted. Before we move on to steering the discussion more purposefully into strong visibility candidates, I realise we need to provide some pointers for some persistent Portfolio related questions. As mentioned before this is not my (or any VP core team member portfolio) but a portfolio from a VP follower-fanatic from 2013 who was kind enough to allow us to put it up for discussion/illustration. In the bargain, he felt all of us may be able to use it/benefit from a constructive re-structuring exercise (now that the VP Public Portfolio is no longer kept updated). 2.Shilpa Allocation. Why so high? Ha Ha…beauty lies in the eyes of the beholder, so I cannot vouch for his allocation/style. I can say for myself though that I had even higher allocation 25%+ to start with. I thought a) the business model was unique (somewhat like PI, where you invest upfront to put up a huge distance with nearest competition) b) I couldn’t find a fiscally more prudent management (invest heavily in new revenue stream when you are sure even if no revenue comes onstream for 2 years from this, the existing streams are growing enough to provide the 15%+ growths) c) Very long-term milestone setting - visualisation & planning from 10 years before d) huge intellectual capital. And finally @15x trailing perception-performance gap/mispricing was huge. Yes if you appreciate Shilpa Business model, you have to wait for the (disproportionate) rewards. They don’t come linearly, much like PI Industries if you will. That was then, subsequently more capital has come into the portfolio, some other candidates have done exceedingly well too, Allocation at Market value now is around 18-19%. Given the delay/slippage on USFDA approval for formulations facility, and the attendant Risks, I am in the process of re-looking at this critically, might bring allocations down to 15% or slightly less. 3.Capital Allocation? How should one go about it? There is a whole thread on Capital allocation, where Mr D has laid it out very simply, very beautifully. If someone has not read it, I encourage you to drop everything else and first try grasping that central concept. To answer the more pointed question on transcribing Conviction to an allocation number - what I can say is High Conviction is not developed on day one - or say when we invest after doing all the hard work we can - at that time we invest at best on a well-tested hypothesis. In my case I play concentrated, so I do not invest less than 10%. And if I cant invest 10%, then why bother? In my case I have seen Conviction gets built up every year - as we see the businesses performing, and the Management walking the Talk. In all the businesses whether it was Astral, Mayur, Ajanta, Pi, Shilpa, Alembic, Avanti - it was built up with every year of performance, and we could keep allocating more especially till 2013 - till when valuations had always remained reasonable. All said and done, whatever we do, we must be able to sleep well. One has to understand oneself first - our own strengths/weaknesses, risk-tolerance, etc. If we are to allocate anything north of 10% ability to do real hard work in knowing everything that can be known about the business - is a must. It’s very risky playing concentrated if we can’t work very very hard to develop independent conviction (or don’t have the time) and can’t be comfortable taking calculated (may be considered aggressive) risks. 4.Restructuring. Every 2-3 years why? Then how is it a Long-Term Portfolio? Hell No. Its not about restructuring every 2-3 years. Its all about identifying long-term candidates. That’s how we are still holding onto an Ajanta Pharma, PI Industries, Shilpa Medicare, Avanti Feeds, Alembic unchanged. But its also about looking critically at the Portfolio every year/6 months, do the existing candidates qualify to stay on for the next 2-3 years? Do they show strong 25% Cagr visibilty ofr next 2-3 years? Have valuations gone very rich? Have the Business Quality/Management Quality and/or our understanding of the same changed? Thats why we have pared Astral, Mayur and Polymed Holdings, and exited Atul Auto, and Kaveri Seeds. Are there new better candidates with stronger visibility and better valuations?? Now that valuations are lower, possibly there are many. That is the main agenda of this thread. Hope to steer the discussion towards that soon. Disc: The above are illustrative answers to clarify often asked questions on the thread. These are not to be treated in any way as investment recommendations/advise. As I have observed in past few years, sectorial bull runs that are structural in nature start in sectors where there are many small companies(in terms of market cap) and by some circumstances there is huge tailwind (the lollapaluza effect). 2000s was the case for IT sector, there were many players and a huge tailwind. 2008 till now is about pharma where the US generic opportunity created many winners in the pharma sector. Also the sector should be meaningful enough that the topline and bottomline effects the overall economy. I feel there are many listed companies in the NBFC space catering to both rural india and urban india. Apart from HDFC, I don’t see any BIG GIANT company here. The total market cap of the NBFC sector is too low compared to the GDP. There is also huge tailwind in consumer credit. Growth in credit for 2 wheelers, 4 wheelers, housing, education, consumer durables is visible. Plus each NBFC is catering to different sets of consumers. They have unique business models…some are doing urban, some are rural, some are saleried, non saleried…all variants are available. Also if we look at the price action to name a few Bajaj Finance, Gruh, Repco, etc are not at 52 wk lows…indicating that there is some smart money moving here. When I look at the NBFC space all I can find is HDFC. These are my personal views and I do believe that the NBFC space will produce some NIFTY or SENSEX candidates in next few years. I think they are in transition. I think the leadership in these markets will change. I look at this fall as a process of that leadership change. So, when market recovers, it will not be the leaders of the last few years which will outperform but a new leadership should emerge. I think these sectors will be related to capital expenditure. Transition means that you give up something which has worked for last cycle – in this case FMCG, pharmaceuticals, etc and adopt something new. This will take time as there is reluct-ance to adopt something new, to give up what has worked in the past. This can cause some pain in the short to medium term. I agree partially in that there will be a leadership change but not necessarily from Pharma per se. Within Pharma sector itself there would most likely be a churn and new set of leaders may emerge. Recent events such as FDA Warning Letters/Import Bans, Price-gouging being hotly debated among US Presidential candidates will continue to contribute to this churn. But these headwinds can be an opportunity for the second-rung midcap pharma such as Cadila/Biocon(with Biosimilar Plays), Aurobindo/Lupin (Complex Generics) to throw themselves into the gauntlet and take the leadership mantle. There are no questions about the management pedigree, execution capability and integrity. But what i fear is they have left it too late to join the US Bandwagon. They have a very small pipeline with no indication of complex generics amongst it. They do have the rep of bringing first-time launches into the Indian/African markets, but they are in “me-too” segments. Moreover, there is no visibility from DMF filings abt potential ANDA’s. 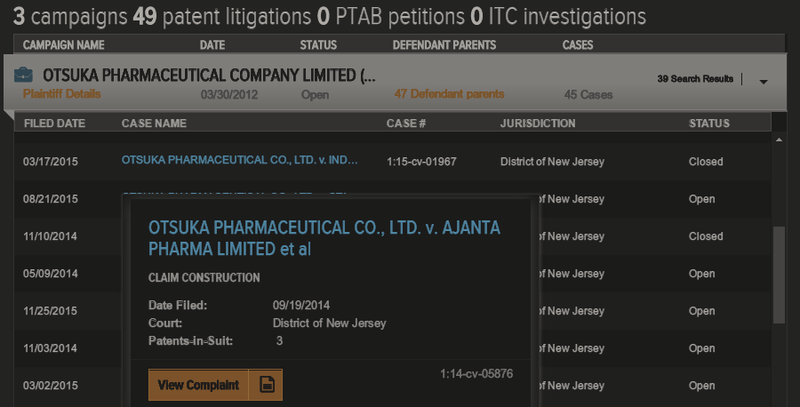 If we take Aripiprazole, there are 49 patent litigations (of which 7 belonging to the FTF exclusivity group) in US Courts, with Ajanta is among those awaiting closure. So even if Ajanta gets the eventual approval, the market is essentially commoditized to have any meaningful impact on revenues. So unless, the ANDA is Para-IV or a complex generic with limited competition, one cannot expect windfall gains. Next 2-3 yrs, Ajanta with small base effect can have growth in earnings. But by FY18 if we do not start seeing complex generics filings, then it starts getting tough. 1 Complex Generics - Peptides, Copaxone, NBCD. 2 NDDS - Drug Delivery mechanisms like nasal, patches etc. With the above aspect, Alembic looks better placed than Ajanta with their recent ramp-up in R&D by setting up dedicated centre, successful approval and launch of gPristiq thru 505(b)(2) pathway, latest onco DMF Filing. Shilpa still looks good as immunotherapy for cancer is still evolving and small-molecule drugs will continue to remain in focus atleast till FY20, as NDA’s use them as part of combination drugs with other small molecule API or more-complex biologics. Disc: Had sold off Alembic in Mar-Jul 2015 (felt valuation was very expensive) and Ajanta in recent correction to shift to Torrent and further add Shilpa. Would have loved to add back Alembic in today’s wild correction at 515 but lack of fresh funds leave me rueful but not sad. Digital banking - Companies which build scalable digital platforms stand a great chance to capitalize and even established IT service cos can cash in as there is the carrot of on-tap licencing of payment banks in future. After all there is only so much one can squeeze from the automation and IoT if one cannot monetize and make a product out off it. Education - Excellent thread by @rohitbalakrish_ on MT Educare will provide all the info. I saw the below 2 tweets which resonated with my focus on CRO’s and Life-science tech companies. Unless pharma becomes a data-analytics company in the business of making medicines, it can never truly be patient-centric. Data, not drugs. Today pharma is a law firm that is also in the business of making medicines. It can never truly be patient or customer-centric. With lot of focus on Pharmacovigilance, Personalized Medicine, etc… there is clear need for technology to remove inefficiencies to provide best-in-class patient care. Emerging therapies based on Gene-editing such as CRISPR, or Immuno-therapy require genome sequencing to select the best-fit drug (most of the case a biologic) among the possible candidates, which has the best chance to activate the T-cells with the maximum effect, as the same drug may have different impact depending on the patient’s immune system. There is a lack of EHR/EMR (Electronic Patient Records) awareness among health-care providers in India generally. It is gaining traction among major hospitals with companies such as Ohum Healthcare, but doctor awareness continues to be a hindrance as they are used to writing the notes on paper files. But in the long-term, as this gains traction, it has lot of positive downstream effects if one incorporates IoT (wearables and biosensors). It would help CRO’s to recruit more easily and effectively and provide real-time post market surveillance data as part of Pharmacovigilance requirements. All the above views are far-sighted, and with the recent pace of innovation it may be sooner than we think. One just needs to look out for the hidden signs. @Donald Thank you very much for your write-ups in this forum. I always think how someone can write so nicely. I am beginner. Please bear me. Maintaining a concentrated portfolio is a very hard job. We need to work harder for that. One has to build the conviction over the time to make the portfolio concentrated. I have a question. When one should exit in a concentrated portfolio. I hope the decision should be quicker than the diversified portfolio. Let’s have a example of Kitex or Kaveri. For any business we need to believe the management guidelines forward and invest expecting the forward earnings multiples. For Kitex as per the management they will meet the guideline of sales/profit. Then over the time how one can stand over the negative energies and the dent in the share prices over the year. So as kaveri. The prices fall from the top and by the time it post biggest quarter in less sales/profit, the share price is dented to maximum possible. So that point is also looks attractive if one going to invest freshly. So I need a generic reply that when one should take a decision of exit or continue invested. If you are not comfortable with above examples you can take any other stock and price points for the discussion. Disc : Any stocks discussed in this post should not be treated as a investment advice. I am currently reading a book called ‘Superforecasting : The art and science of prediction’ by Philip Tetlock. Though it’s not specifically about stocks or investing or trend spotting, predicting/forecasting is definitely a part of stock investing process. Haven’t finished the book yet but I’m liking it a lot. You may give it a try. Corollary: It pays to do all the work early - before there is consensus on the street - while the story is still misunderstood - there lies the real Alpha. Concentrated portfolio is not for passive investors who can’t/don’t have the time/effort to build their own independent conviction in the business. Borrowed conviction down the line (from posts of the best of experts/hard workers) might be setting yourself up for failure …sooner than later; especially if you are one who joined the bandwagon after there is consensus on the streets. You speak to anyone who intrinsically (suited) likes to play “Concentrated”, you will invariably find them admitting to a “Lazy” approach. It is essential to have done that degree of homework and hence build in the initial Conviction, to give the business and Management a longer rope (atleast 2-3 years) to play out that Conviction. The laziness is essential to be able to stay away from NOISE. That’s a very important behavioural trait needed to stay put in a business over 5 years or more (on top of all the hard work/conviction you may have built up - to be able to Ignore the Ignorables, as Hitesh would put it). That rare behavioural strength can also be your Enemy. My experience says, the right mix of laziness/vigilance & discrimination is all there in those first 2-3 years of investment in a prospect, where you are alert. The challenge comes in the subsequent 2-3 years, actually. By God’s grace if your story does play out and you make a few multiples in that investment meanwhile, you run the REAL risk of COMPLACENCY setting in, falling in love with your business. It was a mix of 2 & 3 for me in Kaveri case. BQ/MQ proper assessment/refinement was lacking as well as Complacency (as I had mentioned in Kaveri thread). One cannot learn everything through vicarious experiences (reading up, others experiences) only, you gotta pay some tuition fees too. I am glad I paid some after almost 4 years of fairy-tale existence. My experience also shows Risk/Reward are proportionate in this game. If you like to play concentrated, then surely, you must also have the stomach to digest the possibility of 2 out of 10 bets going wrong - despite your best efforts (to the best of your current abilities). But the 8 bets that go well make sure the rewards are still disproportionate, with caveats 1, 2 & 3 in that order. Kitex is still work in progress for me. I believe the business has lot of potential. I want to see how the US forays play out before sitting on judgement - I need to give the business that much long rope to play out, despite many valid objections/observations on Management operating style/stubborn convictions. But that’s my reading, and I can be totally wrong. Disc: These are illustrative answers. Not to be treated as Investment advise. Thanks to recommendation by @anil1820 - Free Capital by Guy Thomas is another excellent book. It is about 12 full-time investors/traders and their investing philosophies while they are classified as geographers (macro), surveyors (micro), activists and eclectics. Most of them explain how they went about building up their stock rationale with their actual investments. Another is “The Shipping Man” - Matthew McCleery. Although this aspect is equally important in any investment decision whether it’s a diversified or concentrated portfolio approach, but, it’s of prime importance in case of concentrated portfolio. Entry at an early stage of a wealth creation cycle when all triggers have not started playing out is the most desirable entry point and the maximum risk is when we are past half way of the wealth creation cycle. It is usually this point post which either a company becomes a perceived blue chip company or looses its momentum. By keeping our entry point up to the halfway of wealth creation cycle of a stock, we can minimise capital losses significantly in case of a failure which is of prime importance in a concentrated approach. My entry points in Riddhi Siddhi Gluco and Jubilant Industries at an early stage helped me exit them at negligible loss whereas my entry point before halfway in MPS helped me exit at no capital loss. Each company formed average 25 % of my portfolio at the time of my decision to exit. 2. Keep your own milestone-list ready with the time period and grace period. This is the second most important aspect…when one makes an investment decision, he has to keep a list of triggers/milestones he expects his invested company to achieve and by what timeframe. In addition, he has to beforehand determine the grace period he would give in case such events don’t occur in expected timeframe. By strictly following this, he can often avoid capital destruction. However, concentrated portfolio investors (including me ️) are always seen complacent in adhering to such determined timelines. This is because we have put our money on very high conviction ideas by doing lot of homework and when things don’t turn out as anticipated we prefer to give more time often even beyond grace period unless it’s an all and all mess. If I would have personally followed this approach strictly, I would have exited my failures with significant capital appreciation. In a concentrated portfolio never bet on a management which is even slightly shady or pare down your allocation as soon as you find first signs of disconnect or management not walking the talk. Investing in a ‘certain’ environment even at a higher entry point is far better than remaining invested significantly in an ‘uncertain’ environment. 4.Keep doing lot of work on your invested ideas. Your work doesn’t finish by just putting a lot of effort for building conviction and investing in your conviction…the work actually increases post investment. One needs to keep a tight check on the macros as well as micros, keep checking how peers in the segment are performing, if any particular milestone is not getting achieved then go into detail asto what is the reason, etc. You rarely get the warning signs of a failure from the management. Managements, because of their many constraints, always play down many things but you need to pick them up from your efforts. 5.Don’t let the quantum of information go over your head. A lot of work and information gathering carries a risk to distract you from your own conviction. One has to learn the right use of information by being able to see the thin line between an imminent failure or just lengthening of the story’s play out period. In case information is not interpreted in right way and with cool mind, one risks the possibility of loosing a winner. Concentrated portfolio investors often underestimate the wealth creating potential of their winners because of their lower entry point and amount of capital appreciation that they are sitting on. One has to ride their winners fully as real winners are not many relative to half winners and failures. 7.Rationalise your expectations as your absolute portfolio value gets bigger. As you win and attain success via concentrated portfolio approach, your portfolio value will naturally get bigger. After many successes too, a concentrated portfolio investor will never loose that approach, but, with a bigger quantum, highly concentrated portfolio approach is very risky. Hence, even within concentrated portfolio, one needs to rationalise his return expectations at one particular point of time by betting on potential only 1x time compounder in addition to 3x, 4x compunders. Discl. - This is not an investment advice and is part of a general discussion. Sir my picks for 25% cagr for nest 3 years will be tata elxsi, repco home, bajaj finance, 3m india, page industries and symphony. In general finance sector could be my dark horse.lets see if i can guess some more in future ( with a right to go completely wrong). Disc: invested in page ind, repco & tata elxsi and 3m. Shall you please share the excel and basic behind it. As growth in a stock market would be directly linked with economy doing well, I believe the factors that would contribute to the economy growth would equally well contribute to the stock markets. I believe urbanization will be one of the major growth areas if economy grows. As the per capita income grows there will be people moving to bigger and bigger cities with reasons like education, job, higher standards of living. One reason the urbanization wouldn’t grow as expected would be the development of the rural areas. Banks - I would prefer public banks over private as the growth of public banks is inevitable (even if there are challenges) if economy needs to grow at decent rate. In general I believe the fortune is surely in serving the people at the bottom of the pyramid and any sectors that has highest reach in affecting rural life will be winners. thats a very good post mahesh. could you quantify big portfolio?. i know its relative. but generally speaking what is considered a big portfolio (for concentrated portfolio risk)? .Rationalise your expectations as your absolute portfolio value gets bigger.As you win and attain success via concentrated portfolio approach, your portfolio value will naturally get bigger. After many successes too, a concentrated portfolio investor will never loose that approach, but, with a bigger quantum, highly concentrated portfolio approach is very risky. Hence, even within concentrated portfolio, one needs to rationalise his return expectations at one particular point of time by betting on potential only 1x time compounder in addition to 3x, 4x compunders. I’ve worked for two extremely successful investors who were experts in cyclical, commodity-dependent, capital intensive industries – real estate and mining – and learned that almost all of the real money made in those areas is made only by extremely patient investors who invest once every ten or twenty years, liquidate their holdings once a decade and spend long, long periods of time in cash. The role of financial markets is to take money away from mediocre and under performing companies and put it in stable, growing, high return on capital companies. Money has an almost metaphysical attraction to places where it is put to careful, good use. You can fight that trend, and invest in companies, for instance that are deeply undervalued and mismanaged – and some people are successful investing in the dregs – but very few over the long term. To use a whitewater kayaking analogy, freshwater seeks salt water, and you can fight that if you want, but paddling upstream eventually is likely to become highly problematic. The approach that’s worked best in my experience is investing in high return on capital, low debt, growing companies that have the ability to reinvest earnings in the business and generate high returns on those reinvested earnings. The power of compound interest is so profound (mind-boggling really) that over time, returns in investments in those companies are enormous. The trick is finding companies that are compound interest machines. Is it a good idea to look at it in absolute return terms instead of CAGR?. Because once the portfolio size becomes large, then even a 10-12% return can add good incremental value to the portfolio. So an investor is better off sticking to the gsk consumers, pidilites of the world. Of course, he can still continue with the existing winners like bajaj finance, page, ajanta etc. but any incremental addition will go to such names. one thing that worries me is that, even after this correction, all the high quality growers are still overvalued or priced for perfection. Industries which will see huge disruption (sooner than we expect ?)1. Consumer Auto segment (Electric vehicles) : 100x fewer moving parts than existing gas based ones. Not sure if any of Indian car companies are innovating here. 2. Banking (mobile) : Here I see Private Banks doing a better job and capturing good market share from PSU banks. I rarely visit Bank and so why should Banks have so many branches (esp in Urban areas) ?. Another aspect is the technology behind bitcoins. RBI too is looking at it. Will we reach a point sometime in future, where we need not go through a bank for transactions (how would this affect the banks) ?. 3. Power (Renewables - Solar + Wind) : Who will emerge leader here (given than India has set a huge 100GW target from Solar alone) ?. Should we look at proxy plays here (focus on companies which will enable this growth (e.g, grids, transformers, electricity storage …)4. Manufacturing (3D Printing) : Are there companies in India look at the potential of this ?. How would this disrupt some of the manufactoring companies ?. 5. Education (Digital) : Education is a key sector (preschool, K12, higher edu, vocational etc.,). Traditional skill training companies are going the digital way (e.g: http://www.niit.tv) and how can coursera like model disrupt existing way people learn ?6. IT (CAMSS - Cloud, Analytics, Mobile, Social and Security) : Though every company says they are focussing and investing heavily on these, there’ll be very few who will end up making money. Cloud has many flavors (Public could is hugely commoditized one). One should look for companies which create niche solution around this space (than a mee too ones). Technology changes so fast and open source community plays a huge role here. Not sure if anyone can bet for very long term (10-20 yrs). 7. FMCG (Organic) : Our forefathers were doing organic farming and were consuming organic food. We then introduced hybrid seeds, fertilizers, pesticides etc, and now people pay premium for Organic food …so players focussing on organic food may emege as winners in future. 20 years down the lane, if say 30%+ ppl chose organic way, many pesticide, fertilizer companies would cease to exist.8. With stricter rules/enforcement, black money transactions should keep going down in future and how would this change real estate industry ? Good vision. I suggest consider Carbon Fibre technology (in addition to 3D Printing that you have already considered. In India, I could identify only one (failed) venture called Kemrock. Globally, this is a promising high tech material tougher than metals. Even Boeing of the world use it. Now that we have discussed the sectors to a good extent, we should start focussing on individual companies and compare them against the ones in model portfolio. Are there new better candidates with stronger visibility and better valuations?? Now that valuations are lower, possibly there are many. That is the main agenda of this thread. @Donald, Do you think preparing BQ/MQs (or collating, if one already available) for the candidates in model portfolio would be a good starting point ?. And then prepare similar reports for new candidates which will aid in finding the right mix. VP started with the ethos of “Separating the Wheat from the Chaff”. We are perennially on that quest of finding which is a superior business, and why. It’s not necessary to investment in everything. It pays to be choosy. The Guru asks us to be very very choosy - 20 strikes in a lifetime!! The Art of Valuation thread has tried to capture most of our learnings of last 5 years of that quest. By the time we had refined our BQ/MQ Templates in mid 2015, and started presenting/interacting at Investment academies like FLAME, It suddenly dawned on me one day that Guru Buffet has already answered the Holy grail of Investing …in a very simple easily understandable single para…when asked …What is the Ideal Business to Invest in?. The ideal business to invest in is one - where we can continue to invest large sums of capital - at high rates of return - for a long period of time. Today, I am completely convinced - No matter how many books you read, how many gurus you follow, and how many seniors you interact with, no matter how many years of investing acumen you bring to the table - IN THE END, this is the crux one will inevitably keep coming back to, if one is put on the spot and asked to summarise one’s 10/20+ years of Investment Learning. Once we internalise this single Investment Tenet for what (I think) it is, it is time to start applying it sincerely, honestly in our quest for the best of investment prospects that can meet these simple requirements ha ha ! Let’s not worry about extensive BQ/MQ Templates for the time being. I am sure once we have a distilled list, there will be enough passionate hands raised to create the BQ/MQ sheets to separate the wheat from the chaff, again. Let’s also not be picky about giving our best ideas (we think) away. If idea has merit by sharing/defending, our own conviction is bound to grow from objections handled, arguments refined. Most in market are interested anyways in Momentum, very few takers for Long Term bets. We will probably see that the best high conviction ideas that emerge, mostly are from the KNOWN universe. Do you think it will be a useful exercise for all?